Global Shade is proud to be one of Australia’s leading manufacturers of shade cloth structures. We offer a range of superior shade products that are manufactured using industry leading shade cloth fabrics. Regardless of what shade structure you consider, the quality of a shade structure will depend on the quality of the shade cloth fabric used. Today, I will tell you more about the fabrics we use in the manufacturing of our shade cloth structures. Hopefully, this article will give you a better idea of which shade cloth fabric to choose before placing an order. A heavy-duty shade cloth fabric manufactured by Rainbow Shade, Xtreme 32 is specifically designed for use in large scale shade cloth structures. It offers excellent dimensional stability and offers high resistance. A fire rated fabric, Xtreme 32 offers easy maintenance, and it comes in a choice of 14 designer colour options. This shade cloth fabric offers great UVR protection of up to 95.8%, and a 10-year limited warranty covers it. A commercial grade shade cloth fabric, Parasol is ideal for use in commercial grade shade cloth structures and heavy-duty applications. This knitted fabric consists of a blend of high-density monofilament and tape for added strength and abrasion resistance. This fabric is also UV stabilised, and it offers high UVR protection. Parasol is a heat set fabric, and it is available in a choice of 15 colour options. As the name implies, Commercial 95 is a commercial grade shade fabric that is suitable for use in a variety of shade cloth structures including shade sails and tension membranes. This fabric features the perfect combination of durability, strength and sun protection, and also offers maintenance-free long-lasting performance. This shade cloth fabric is manufactured using high-quality, UV stabilised HDPE, and it offers great UVR protection of up to 97.7%. Commercial 95 comes in 20 colour options, and a 10-year limited warranty covers it. Designed to offer the best in strength and durability, Extrablock is a heavy-duty fabric manufactured using virgin HDPE. It offers an excellent combination of dimensional stability, controlled elongation and offers exceptional fray and tear resistance. This shade cloth fabric comes in a choice of 17 California Fire Marshall approved colours. Extrablock offers exceptional UVR protection of up to 98%, and it is a UV stabilized fabric. A 10-year warranty backs this shade fabric. Designed to be used as an install-and-forget product, Monotec 370 Series is a versatile fabric that suits a variety of shade cloth structures. Manufactured to the highest quality standards using 100% monofilament HDPE yarns, this shade cloth is highly resistant to UV rays, offers great dimensional stability and is fire retardant certified. Monotec 370 Series comes in a choice of 14 vibrant colour options, and it is the only shade cloth in the industry to be backed by a 15-year manufacturer’s warranty. The quality of a shade cloth structure depends on the quality of the fabric being used. At Global Shade, we make use of industry-leading shade cloth fabrics in our products. The fabrics that we rely on include Rainbow Xtreme 32, Protex Parasol, Commercial 95, Allnet Extrablock and Monotec 370 Series. These fabrics offer extended manufacturer warranties back great strength and excellent UVR protection – you can’t go wrong in choosing any of them in the manufacturing of your shade cloth structure. 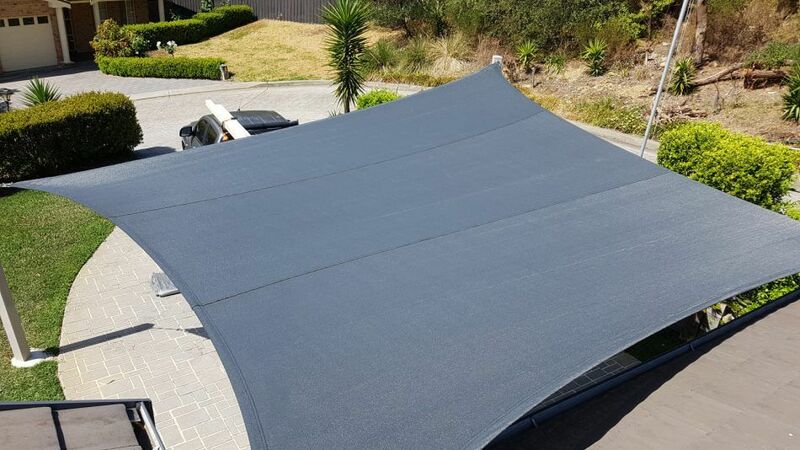 If your looking to have a shade cloth structure manufactured for your home or business – anywhere in Australia – look no further than Global Shade. Call us on 1800 724 407 to find out more about our shade cloth structures today!